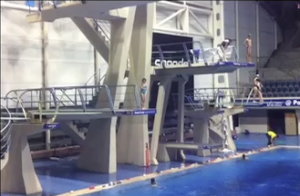 One of my favourite parts of the week is when I take my 8 year old daughter Gracie diving at Ponds Forge in Sheffield. She has a 40 minute lesson and for those who are not local, the diving facilities are amazing. Boards of various heights up to 10 meters and an amazing diving pool, complete with a large video screen with a 10 second delay so you can see your last dive from a side angle. Joyous. Anyway there are two reasons I love to watch Gracie dive. One reason is that I love to watch Gracie do anything. It seems like yesterday that she was a baby. So to watch her nervously step out on the three meter board and jump off it is a joy. Every week she improves and becomes a little more confident, and I love to see improvement in anybody. It fascinates me how our minds and bodies adapt to the challenges we throw at them. The process of practice and improvement is a pleasure to see. Everything that I see my kids get a buzz from gives me a lovely feeling of wellbeing. Anyway, the second reason I love to watch is that at any one time, there will usually be three or four people diving off the various boards. It’s a hive of activity and the rhythm of the plunging bodies twisting and somersaulting through the air into the water is both meditative and satisfying. It’s also very important to my daughter’s progress and improvement. I was watching this and thinking about my life (as you do when approaching 40), of the little things I have spent time trying to learn and improve. Many of which have shaped my career and my happiness. Also, I was thinking about new challenges I have excitedly taken up, only to quit after a few weeks. My wife will attest to my weekly ideas and obsessions. Without her to steer me, I would be a jack of, literally, all trades. If we think about the main ingredients for improvement in any skill, we think about the practice. Practice does indeed make perfect, or the closest we are able to get to it depending how much it means to us and how much time and work we are willing to put in. But there is an ingredient we often forget about which will mean the difference between success and failure. Without it there is no long-term success and only short-term improvement. Unfortunately, many of us don’t even think about the importance of it when we embark on a new learning experience and therefore burn out, get bored and move on, wasting all those hours we have previously spent practising. The secret ingredient is Belief. We must have no doubt that we can achieve those things that seem so overwhelmingly difficult when we start. Playing bar chords on a guitar, juggling 5 balls, olleing on a skateboard (a very difficult jump using momentum, coordination, leg power and pure knack), fanning a deck of cards and of course diving off the 10 meter board. Oh, and driving a car. When we look at driving it seems like an easy thing to do. Why? Because we are surrounded by people doing it. We are given evidence that it is possible and therefore we have Belief. We are programmed to believe that we can do it because we all know so many people who can drive. Regardless of talent, upbringing or culture. But it’s not easy. Remember your first few lessons? I have no doubt that if we were learning to drive a car and had never seen a car or seen anybody driving a car, it would take a lot longer to master and most of us would probably quit. But we don’t – this is the power of belief. So back to the Diving. My Gracie is surrounded by people pulling the most amazing moves off of the 10 meter, the 7.5 meter and the springboards. It’s incredible to watch but now she takes it for granted. To her it is a given that she can achieve the same. These people are not super-human and have no amazing innate talent. They have just taken the same journey as her. It’s just a matter of time, practice, passion and of course belief. I can honestly say that anything I have ever done, learned or achieved is a result of being inspired by others. In seeing that anything I want to achieve is possible, from learning to walk to performing a challenging magic trick, belief has helped me succeed and deal with reoccurring failure. If you are learning anything or embarking on a new chapter in your life, please find others who have succeeded in the same field. See the possibilities and I promise it will make a huge difference. Great to hear from you Steve. Keep the communications coming! Steve, your article reminds me of the great book: ‘Think and grow rich’, for the seventh and final key is to build a support group around you, who will encourage you to achieve your burning desire. That’s what I perceive you are doing for young Gracie; she’s very fortunate to have such a committed and loving father! Good man! It is a joy to read your thoughts and to read about your emotional “being” and growth. I have something I would like to discuss with you. Will send you another email. How to perform under pressure-Part 1.